Louis Spohr was one of the most significant personalities in German music in the first half of the nineteenth century, equally outstanding as a composer, violinist, conductor, teacher and organizer who was considered a leading pioneer of early Romanticism. In fact he ranked during his lifetime as a member of the pantheon of great composers, his music played and loved by thousands. Gradually he slipped from this Olympian height, but in more recent decades he has enjoyed something of a revival, mainly fuelled by his delightful chamber music including the Nonet and the Octet (on Hyperion CDA66699) and the Double Quartets (on Hyperion Dyad CDD22014) and also by his numerous works for clarinet. Spohr, who was born in Brunswick on 5 April 1784 and died in Kassel on 22 October 1859, was a twenty-year-old violin virtuoso when he shot to fame after a sensational concert in Leipzig on 10 December 1804. The following year the young composer was offered the post of Music Director at the enlightened court of Gotha and, at twenty-one, he became the youngest incumbent in Germany of such a position. His Gotha employers were sufficiently worried by his youth that they publicly declared him to be a few years older—perhaps a necessary strategy when deference to age and experience was the norm. It was at Gotha in the autumn of 1808 that Spohr met the clarinet virtuoso Johann Simon Hermstedt, and the two men hit it off straight away. Spohr immediately began work on the Concerto in C minor. Hermstedt was so taken by the work that—rather than insisting on the composer modifying some of his more outlandish, and unplayable, demands—he adapted and expanded his instrument to suit the music, thus bringing about important developments in the range and flexibility of the clarinet, expanding it from five keys to thirteen. In the summer of 1810 Germany’s first genuine music festival was staged in Frankenhausen and Spohr was selected as conductor, a remarkable accolade as he was by far the youngest contender for the position. Hermstedt’s appetite for new Spohr works was insatiable and he proposed that he should unveil a second clarinet concerto at the festival. Accordingly, Spohr got to work during the spring and the Concerto in E flat major was first performed by Hermstedt at Frankenhausen on 22 July 1810. The British clarinettist Michael Collins is one of the most sought-after and successful wind players of his generation. At the age of sixteen he won the woodwind prize in the first BBC Young Musician of the Year Competition, and at twenty-two made his American debut at Carnegie Hall, New York. Since then he has performed as a soloist with many of the world’s major orchestras and most renowned conductors. This is his first solo recording for Hyperion. Spohr, who was born in Brunswick on 5 April 1784 and died in Kassel on 22 October 1859, was a twenty-year-old violin virtuoso when he shot to fame after a sensational concert in Leipzig on 10 December 1804. The following year the young composer was offered the post of Music Director at the enlightened court of Gotha and, at twenty-one, he became the youngest incumbent in Germany of such a position. His Gotha employers were sufficiently worried by his youth that they publicly declared him to be a few years older – perhaps a necessary strategy when deference to age and experience was the norm. It was at Gotha in the autumn of 1808 that Spohr met the clarinet virtuoso Johann Simon Hermstedt (1778–1846), the wind band director at the nearby court of Sondershausen. Hermstedt’s ducal employer despatched his clarinettist to Gotha to commission a concerto from Spohr and the two men hit it off straight away. Both worshipped Mozart, both were Freemasons like their hero, and Hermstedt had originally trained as a violinist, so they had a lot in common. The friendship was probably cemented more firmly at one of their first concerts together when they played Mozart’s clarinet quintet with Spohr on first violin. Their fruitful partnership puts them in the company of Mozart and Anton Stadler, Weber and Heinrich Baermann and Brahms and Richard Mühlfeld, three great composers and the clarinettists who inspired them to produce some of their finest works. So it was with Spohr and Hermstedt. Spohr immediately began work on the Concerto in C minor and took it to Sondershausen in January 1809 to go through it with Hermstedt. At the time, while Spohr was familiar with the range of the clarinet, he knew little about its strengths and weaknesses and planned to adjust his score in the light of Hermstedt’s advice. But the clarinettist liked the concerto as it was and assured Spohr that he would adapt and expand his instrument to suit the music. And so he did, thus bringing about important developments in the range and flexibility of the clarinet, expanding it from five keys to thirteen. Hermstedt’s modifications and alterations were detailed in a preface to the first publication of the concerto as opus 26 in 1812. At the time he wrote the concerto, Spohr was already an experienced composer of works in this form. Though only twenty-four, he had under his belt eight violin concertos, one for two violins, one for violin and cello and two for violin and harp. Although the C minor Clarinet Concerto is broadly in the classical mould with two fast movements framing a central slow one, it differs from the standard model in a number of respects. Firstly, the work opens with a slow introduction which contains the main motif of the first movement; secondly, when the Allegro begins, the soloist enters after only eight bars. The long orchestral opening tutti familiar from the great concertos of Mozart and Beethoven is dispensed with; instead the slow introduction may be said to replace it in a highly compressed manner. The second subject is also built from the core motif but when what is usually known as the ‘development’ is reached a new, completely contrasting and lyrical theme appears. The Adagio is a short, beautiful intermezzo, delicately supported only by violins and cello; even the violas and basses sit out this movement. In contrast, the final Rondo is mainly lively with fiendish humour involving much activity from the orchestra’s wind section though, instead of final fireworks, the key of C minor returns at the end for a gentle and romantic fade out which recalls the more serious mood of the Adagio opening of the whole work. Naturally, Hermstedt was keen for more and so in June 1809 Spohr worked on the Variations in B flat major on a theme from his opera Alruna. This grand Romantic opera, whose subtitle was ‘The Owl-Queen’, had been accepted by Goethe for production in Weimar but during rehearsals Spohr came to the conclusion that it was a dramatic failure and managed to get it withdrawn. Nevertheless, he still thought highly of the music and drew upon it more than once in the future. The theme he chose for this set of variations is the opera’s seventh number, the duet ‘Euer Liebreiz, eure Schönheit’. The theme’s entry is preceded by a slow introduction, and then Hermstedt is put through his paces. Appropriately enough the piece received its premiere in Weimar on 15 January 1810. In the summer of 1810 Germany’s first genuine music festival was staged in Frankenhausen and Spohr was selected as conductor, a remarkable accolade as he was by far the youngest contender for the position. Hermstedt’s appetite for new Spohr works was insatiable and he proposed that he should unveil a second clarinet concerto at the festival. Accordingly, Spohr got to work during the spring and the Concerto in E flat major was first performed by Hermstedt at Frankenhausen on 22 July 1810. He had brought his own specialist wind players from Sondershausen to reinforce the festival orchestra so Spohr took full advantage of their presence and ability with much interplay for them with their clarinettist director. For the E flat major Concerto Spohr follows tradition with a full-scale opening tutti though, after a call to attention from the orchestra in the first few bars, he slyly lets the soloist respond briefly before the tutti gets fully under way. As befits the original occasion there is much festive writing for trumpets and drums while a march rhythm dominates the second subject which first appears in the unexpected key of D flat major before reaching its destination of B flat major. Again there is a new theme in the ‘development’ section which provides a contrasting romantic lyrical quality to the surrounding festive pomp and, as in all of Spohr’s four clarinet concertos as well as most of his others, no space is found for a cadenza. Spohr thought that cadenzas pandered to the worst side of solo instrumentalists and he generally shunned them. For the Adagio, Spohr chose one of his favourite keys, A flat major, which he had also opted for in the C minor Concerto. Here, though, we have a full-scale movement which beautifully exploits the clarinet’s rich low chalumeau register as well as including a wonderfully powerful contrasting section in C minor where the soloist executes dramatic runs and leaps. Also, the orchestral wind, especially the flute and bassoon, step forward to share the limelight briefly with the clarinet. The finale (‘Alla Polacca’ – in the then fashionable polonaise style) begins with solo timpani answered by the horns before the clarinet introduces the main theme; this opening timpani–horn exchange goes on to play a prominent part in the movement. Hermstedt was especially famous for his playing in the upper register so Spohr gives him chance to show off by ascending stratospherically to C altissimo, a real test for a performer even today. The Frankenhausen festival was such a success that another was planned for 1811, also under Spohr’s direction. For this one he was invited to compose a symphony (his first, in E flat major, Op 20) so that Hermstedt, who naturally put in a plea for another new clarinet piece, had to be satisfied with a ten-minute work. Spohr composed the Potpourri in F major in the spring of 1811 and it was first played at Frankenhausen on 11 July that year. The Potpourri was no mere medley; rather its two chosen themes were used as the basis for virtuoso variations. Spohr selected his two numbers from a then highly popular opera, Das unterbrochene Opferfest (‘The interrupted sacrificial feast’), by the Mannheim composer Peter von Winter (1754–1825), and produced what is in effect a three-movement concertino. The opening section, Larghetto, works with Myrha’s aria ‘Ich war, wenn ich erwachte’ (No 9 in the opera) and the prominent horns at the start have been lifted from the opera along with the theme. Next comes an Allegro on a vocal quartet (the opera’s No 8) ‘Kind, willst du ruhig schlafen’, then finally an Allegretto version of the same theme. 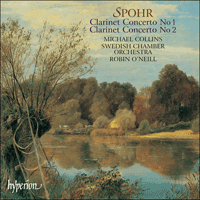 Despite the praise heaped on Spohr’s clarinet compositions, delays in the publication of all except the first concerto, as well as the tremendous technical difficulties they posed, prevented them from claiming an immediate place in the repertoire. The second concerto did not appear in print until 1822 as opus 57; the Potpourri in 1830 as opus 80; and the Variations not until 1890, long after Spohr’s death. So, in a concentrated period of just over two years, Spohr composed for Hermstedt the four works recorded here. More were to follow over the next twenty-six years, two further concertos (F minor, WoO19, 1821; and E minor, WoO20, 1828), a Fantasia and Variations on a theme by Danzi, a Notturno for Hermstedt’s own wind band featuring the clarinet as a solo instrument, a set of songs and an aria, both with a part for an obbligato clarinet. These ten works with clarinet solo inspired by Hermstedt stand proudly among Spohr’s most inventive and attractive compositions. Compositeur, violoniste, chef d’orchestre, professeur et organisateur remarquable, considéré comme l’un des principaux pionniers du romantisme primitif, Louis Spohr marqua la musique allemande de la première moitié du XIXe siècle. En réalité, son œuvre, interprétée et adorée par des milliers de personnes, le fit entrer de son vivant au panthéon des grands compositeurs. Puis il glissa peu à peu de ce piédestal olympien, même si ces dernières décennies lui ont valu une sorte de résurrection, alimentée surtout par sa délicieuse musique de chambre – ainsi son Nonet et son Octuor (Hyperion CDA66699) et ses Doubles quatuors (Hyperion Dyad CDD22014) –, sans oublier ses nombreuses œuvres pour clarinette. Né à Brunswick le 5 avril 1784 et mort à Kassel le 22 octobre 1859, Spohr était un virtuose de vingt ans lorsqu’un concert sensationnel donné à Leipzig le projeta dans la célébrité, le 10 décembre 1804. L’année suivante, le jeune compositeur se vit offrir le poste de directeur de la musique à la cour, éclairée, de Gotha, devenant, à vingt et un ans, le plus jeune titulaire de ce genre de poste en Allemagne. Cette jeunesse inquiéta toutefois assez ses employeurs pour qu’ils le vieillissent publiquement de quelques années – une stratégie peut-être nécessaire à une époque où la déférence envers l’âge et l’expérience était de mise. Ce fut à Gotha, à l’automne de 1808, que Spohr rencontra le clarinettiste virtuose Johann Simon Hermstedt (1778–1846), venu lui commander un concerto au nom de son employeur ducal – il dirigeait alors un orchestre d’instruments à vent à la cour voisine de Sondershausen. Immédiatement, le courant passa entre ces deux adorateurs de Mozart, francs-maçons comme leur héros, qui avaient d’autant plus en commun que Hermstedt avait d’abord reçu une formation de violoniste. Cette amitié fut probablement consolidée par un de leurs premiers concerts communs, au cours duquel ils interprétèrent le quintette avec clarinette de Mozart (avec Spohr au premier violon). Par ce fructueux partenariat, Hermstedt fut à Spohr ce que Anton Stadler fut à Mozart, Heinrich Baermann à Weber et Richard Mühlfeld à Brahms: un clarinettiste qui inspira à un grand compositeur certaines de ses meilleures œuvres. Sans tarder, Spohr s’attela au Concerto en ut mineur, qu’il emporta à Sondershausen en janvier 1809 pour le peaufiner avec Hermstedt. À l’époque, Spohr n’était pas sans savoir l’étendue de la clarinette, mais il en méconnaissait les forces et les faiblesses et projetait donc d’ajuster sa partition à la lumière des conseils de Hermstedt. Or ce dernier aima tant le concerto qu’il assura vouloir adapter et perfectionner son instrument pour pouvoir jouer cette musique. Ce qu’il fit, mettant au point d’importants développements en matière d’étendue et de flexibilité de la clarinette, dont les clefs passèrent de cinq à treize. Les modifications et les changements ainsi apportés furent détaillés dans une préface à la première édition du concerto, paru en 1812 sous le numéro d’opus 26. Lorsqu’il composa cette œuvre, Spohr était déjà, à vingt-quatre ans, un auteur de concertos chevronné, avec à son actif pas moins de douze pièces affectant cette forme: huit pour violon, une pour deux violons, une pour violon et violoncelle et deux pour violon et harpe. Bien que largement coulé dans le moule classique, avec deux mouvements rapides flanquant un mouvement central lent, le Concerto pour clarinette en ut mineur s’éloigne, par certains égards, du modèle standard. Primo, il s’ouvre sur une introduction lente renfermant le motif principal du premier mouvement; secundo, au début de l’Allegro, le soliste n’entre qu’au bout de huit mesures. Le long tutti initial, à l’orchestre, bien connu des grands concertos mozartiens et beethovéniens, est supprimé, remplacé, en quelque sorte, d’une manière fort comprimée, par l’introduction lente. Le second sujet est, lui aussi, construit à partir du motif de base, mais, une fois atteint ce qu’on a coutume d’appeler le «développement», un thème nouveau, complètement contrasté et lyrique, apparaît. L’Adagio, un court et splendide intermezzo, est délicatement soutenu par les seuls violons et violoncelle; même les altos et les contrebasses demeurent étrangers à ce mouvement. A contrario, le Rondo final est avant tout animé par un humour diabolique, qui exige beaucoup des vents de l’orchestre, même si, loin des habituels feux d’artifice finals, la tonalité d’ut mineur revient pour un ultime fondu, doux et romantique, rappelant l’ambiance plus sérieuse de l’Adagio inaugural. Hermstedt ayant, bien sûr, ardemment désiré de nouvelles œuvres, Spohr travailla, en juin 1809, aux Variations en si bémol majeur sur un thème tiré d’Alruna, son grandiose opéra romantique (sous-titré «La Reine-Chouette») que Goethe avait accepté de produire à Weimar mais qu’il parvint à faire retirer après avoir conclu, durant les répétitions, que c’était un échec dramatique. Ce qui ne l’empêcha pas de penser encore suffisamment de bien de cette musique pour y puiser souvent par la suite. Le thème choisi pour le présent corpus de variations, le duo «Euer Liebreiz, eure Schönheit» (septième numéro de l’opéra), voit son entrée précédée d’une introduction lente, avant que Hermstedt ne soit mis à l’épreuve. Cette pièce fut créée, non sans un certain à-propos, à Weimar, le 15 janvier 1810. À l’été de 1810, le premier véritable festival de musique d’Allemagne fut monté à Frankenhausen, avec Spohr à la direction d’orchestre – un remarquable honneur pour celui qui était de loin le plus jeune postulant. Hermstedt, toujours assoiffé d’œuvres nouvelles de Spohr, proposa qu’un deuxième concerto pour clarinette fût dévoilé lors de ce festival. Spohr se mit donc au travail durant le printemps, et Hermstedt créa le Concerto en mi bémol majeur à Frankenhausen, le 22 juillet 1810. Comme ce dernier avait amené de Sondershausen ses propres spécialistes des vents pour renforcer l’orchestre du festival, Spohr tira avantage de leur présence et de leur aptitude à interagir avec leur clarinettiste-chef d’orchestre. Le Concerto en mi bémol majeur respecte la tradition d’un tutti initial de grande envergure, même si, passé les toutes premières mesures où l’orchestre attire l’attention, il laisse, avec espièglerie, le soliste répondre brièvement avant que ledit tutti ne démarre pleinement. Comme il sied à l’événement de départ, l’écriture est très festive pour les trompettes et les tambours, cependant qu’un rythme de marche domine le second sujet – lequel apparaît pour la première fois dans la tonalité surprise de ré bémol majeur avant d’atteindre sa destination, si bémol majeur. Dans la section de développement, un nouveau thème offre, une fois encore, un contraste tout en lyrisme romantique avec la festive pompe environnante et, comme dans les quatre concertos pour clarinette du compositeur, comme aussi dans la plupart de ses autres concertos, il n’y a aucune place pour une cadenza – Spohr, estimant que les cadenzas flagornaient les pires penchants des solistes instrumentaux, les évitait généralement. Pour l’Adagio, Spohr choisit l’une de ses tonalités favorites, la bémol majeur, qu’il avait également retenue dans le Concerto en ut mineur. Ici, cependant, nous avons un mouvement d’envergure qui exploite magnifiquement le riche registre grave (chalumeau) de la clarinette, tout en renfermant une section contrastée, merveilleusement puissante, en ut mineur, où le soliste exécute des passages rapides de notes et des sauts spectaculaires. Les vents orchestraux, notamment la flûte et le basson, s’avancent d’un pas pour partager brièvement les feux de la rampe avec la clarinette. Le finale («Alla Polacca» – dans le style de polonaise alors en vogue) s’ouvre sur les timbales solo, auxquelles répondent les cors, puis la clarinette introduit le thème principal et ce premier échange timbales – cors se poursuit jusqu’à assumer un rôle prépondérant dans le mouvement. Hermstedt étant particulièrement réputé pour son jeu dans le registre suraigu, Spohr lui aménagea une ascension stratosphérique jusqu’à ut altissimo, qui est, aujourd’hui encore, une véritable épreuve pour l’interprète. Fort de son succès, le festival de Frankenhausen fut reconduit en 1811, toujours sous la direction de Spohr qui se vit confier, pour la circonstance, la composition d’une symphonie – sa première, en mi bémol majeur, op. 20. Si bien que Hermstedt, qui implorait naturellement une nouvelle pièce pour clarinette, dut se contenter d’une œuvre de dix minutes: le Potpourri en fa majeur, composé au printemps de 1811 et crée à Frankenhausen le 11 juillet de la même année. Le Potpourri n’était pas un simple medley; disons plutôt que ses deux thèmes choisis servirent de base à des variations virtuoses. Spohr emprunta ces deux numéros à Das unterbrochene Opferfest («Le sacrifice interrompu»), un opéra alors extrêmement populaire du compositeur de Mannheim Peter von Winter (1754–1825), pour produire ce qui est en fait un concertino en trois mouvements. La section d’ouverture, Larghetto, correspond à l’aria de Myrha «Ich war, wenn ich erwachte» (no 9 de l’opéra), et les cors saillants du début ont été pris à l’opéra, tout comme le thème. Viennent ensuite un Allegro sur un quatuor vocal (no 8 de l’opéra), «Kind, willst du ruhig schlafen», et, enfin, une version Allegretto du même thème. Bien que couvertes d’éloges, les compositions pour clarinette de Spohr ne purent prétendre à entrer d’emblée au répertoire, entravées qu’elles furent par des retards de publication (sauf pour le premier concerto), mais aussi par leurs immenses difficultés techniques. Le deuxième concerto ne fut ainsi imprimé qu’en 1822 (op. 57), tandis que le Potpourri ne parut qu’en 1830 (op. 80); quant aux Variations, elles durent attendre 1890, soit bien après la mort de Spohr. Deux bonnes années suffirent donc à Spohr pour composer, à l’intention de Hermstedt, les quatre œuvres enregistrées ici. Les vingt-six années suivantes devaient en voir naître vien d’autres: deux nouveaux concertos (fa mineur, WoO19, 1821; mi mineur, WoO20, 1828), une Fantaisie et Variations sur un thème de Danzi, un Notturno pour l’orchestre d’instruments à vent personnel de Hermstedt, avec clarinette solo, un corpus de lieder et une aria, tous dotés d’une partie de clarinette obbligato. Ces dix œuvres avec clarinette solo, inspirées par Hermstedt, se dressent majestueusement parmi les compositions les plus heureuses et les plus séduisantes de Spohr. Louis Spohr war einer der bedeutendsten deutschen Musikerpersönlichkeiten in der ersten Hälfte des 19. Jahrhunderts und zeichnete sich gleichermaßen als Komponist, Violinist, Dirigent, Lehrer und Organisator aus. Man hielt ihn für einen führenden Wegbereiter der frühromantischen Musik. Zu seinen Lebzeiten stellte man ihn sogar in das Pantheon der großen Komponisten, seine Musik wurde aufgeführt und von Tausenden geliebt. Nach seinem Tod nahm sein Ruhm allerdings Schritt für Schritt ab. In den letzten Jahrzehnten erfreut er sich nun wieder größerer Beliebtheit, die sich hautsächlich auf seine herrliche Kammermusik stützt, wie zum Beispiel das Nonett und Oktett (bei Hyperion CDA66699), die Doppelquartette (bei Hyperion Dyad CDD22014) sowie seine zahlreichen Werke für Klarinette. Der zwanzigjährige Violinvirtuose Spohr, der am 5. April 1784 in Braunschweig geboren wurde und am 22. Oktober 1859 in Kassel starb, gelangte nach einem sensationellen Konzert am 10. Dezember 1804 in Leipzig überraschend schnell zu Ruhm. Im darauf folgenden Jahr wurde dem jungen Komponisten die Stelle des Musikdirektors am progressiv gesinnten Hof in Gotha angeboten. Mit 21 Jahren war er so der jüngste Musikdirektor in Deutschland. Seine Arbeitgeber in Gotha machten sich über sein Alter immerhin so viel Gedanken, dass sie ihn öffentlich als ein paar Jahre älter ausgaben – womöglich ein notwendiger Schachzug in einem Zeitalter, in dem man vorrangig Alter und Erfahrung schätzte. Spohr traf den Soloklarinettisten Johann Simon Hermstedt (1778–1846), den Leiter des Hautboistenkorps am nahe gelegenen Hof in Sondershausen, im Herbst 1808 in Gotha. Hermstedts Arbeitsgeber, der Fürst von Schwarzburg-Sondershausen, hatte seinen ersten Klarinettisten nach Gotha abgeordnet und bei Spohr ein Klarinettenkonzert in Auftrag gegeben. Spohr und Hermstedt verstanden sich sofort hervorragend: beide verehrten Mozart, und beide waren Freimaurer wie ihr Vorbild. Zudem hatte Hermstedt ursprünglich Violine studiert. So hatten Spohr und Hermstedt vieles gemeinsam. Ihre Freundschaft wurde wahrscheinlich in einem ihrer ersten Konzerte, in dem sie Mozarts Klarinettenquintett aufführten, noch mehr vertieft. Spohr übernahm damals die erste Violinstimme. Ihre konstruktive Partnerschaft lässt sich vielleicht mit der von Mozart und Anton Stadler, Weber und Heinrich Baermann oder Brahms und Richard Mühlfeld vergleichen, drei außerordentliche Komponisten und Klarinettisten, deren Freundschaften zur Schaffung von einigen der besten Werke jener Tonkünstler führten. Genauso war es bei Spohr und Hermstedt. Spohr begann sofort mit der Arbeit am Klarinettenkonzert in c-Moll. Mit der Partitur fuhr er im Januar 1809 nach Sondershausen, um sie mit Hermstedt durchzusprechen. Zu jenem Zeitpunkt wusste Spohr noch wenig über die Stärken und Schwächen der Klarinette, auch wenn er mit ihrem Tonumfang vertraut war. Er gedachte, seine Partitur mit Hilfe von Hermstedts Rat umzuschreiben. Aber der Klarinettist mochte das Konzert genau so, wie es war, und er versicherte Spohr, dass er stattdessen sein Instrument verbessern und der Musik anpassen würde. Und so geschah es auch, wobei er wichtige Entwicklungen bezüglich des Tonumfangs und der Flexibilität der Klarinette in Gang setzte, die unter anderem zu einer Erweiterung von fünf auf dreizehn Klappen führten. Hermstedts Umgestaltungen und Änderungen wurden im Vorwort zur ersten Ausgabe des 1812 als op. 26 veröffentlichten Konzerts festgehalten. Als Spohr das Konzert schrieb, war er mit dieser musikalischen Form schon gut vertraut. Im Alter von nur 24 Jahren konnte er auf nicht weniger als acht Violinkonzerte, eins für zwei Violinen, eins für Violine und Violoncello und zwei für Violine und Harfe verweisen. Das Klarinettenkonzert in c-Moll folgt im Wesentlichen dem klassischen Vorbild, d. h. zwei schnelle Sätze umrahmen einen langsamen Mittelsatz, aber es unterscheidet sich auch in vielerlei Hinsicht von der üblichen Vorlage. Erstens beginnt das Werk mit einer langsamen Einleitung, in der das Hauptmotiv des ersten Satzes erklingt. Zweitens setzt der Solist beim Anfang des Allegros erst nach acht Takten ein. Spohr hat sich die aus den großen Konzerten Mozarts und Beethovens bekannte lange Einleitung durch volles Orchester erspart. Vielleicht kann man sagen, dass an ihre Stelle in stark komprimierter Form die langsame Einleitung getreten ist. Das Hauptmotiv liefert auch die Grundlage für das zweite Thema. Ein neues, völlig kontrastierendes, lyrisches Thema taucht schließlich auf, wenn der gewöhnlich als „Durchführung“ bekannte Abschnitt erreicht wird. Das Adagio ist ein kurzes, wundervolles Intermezzo, das nur von feinfühlig begleitenden Violinen und Violoncellos getragen wird. Selbst die Violas und Kontrabässe schweigen in diesem Satz. Im Gegensatz dazu ist das abschließende Rondo überwiegend lebhaft und zeichnet sich durch einen teuflischen Humor aus, an dem die Bläser einen erheblichen Anteil haben. Statt eines abschließenden Feuerwerkes klingt das Werk in einer sanften und romantischen Stimmung in c-Moll aus, die an den ernsteren, das Werk einleitenden Adagio-Abschnitt erinnert. Natürlich wollte Hermstedt mehr davon haben. So arbeitete Spohr im Juni 1809 an den Variationen in B-Dur über ein Thema aus seiner Oper Alruna. Goethe war bereit gewesen, diese große romantische Oper mit dem Untertitel „Die Eulenkönigin“ in Weimar zu inszenieren. Aber während der Proben erkannte Spohr in seiner Oper entscheidende dramaturgische Schwächen, und es gelang ihm, die Oper zurückzuziehen. Doch war er mit der Musik sehr zufrieden. Mehr als einmal benutzte er später wieder Teile daraus. Das Thema, das er dieser Variationsreihe zugrunde legte, ist die siebente Nummer der Oper, das Duett „Euer Liebreiz, eure Schönheit“. Dem Thema wurde eine langsame Einleitung vorangestellt, dann musste Hermstedt seine Kunst beweisen. Wie es der Zufall wollte, gelangte das Stück nun gerade in Weimar am 15. Januar 1810 zur Uraufführung. Im Sommer 1810 wurde in Frankenhausen das erste richtige Musikfest in Deutschland veranstaltet, und Spohr wurde zum Dirigenten ernannt, eine bemerkenswerte Ehrung, war er doch bei weitem der jüngste Anwärter auf diese Position. Hermstedts Hunger auf neue Spohr-Werke war unstillbar. Er schlug vor, auf dem Musikfest ein zweites Klarinettenkonzert vorzustellen. So begann Spohr im Frühjahr mit der Arbeit. Das daraus entstandene Klarinettenkonzert in Es-Dur wurde erstmals am 22. Juli 1810 in Frankenhausen mit Hermstedt als Solisten aufgeführt. Hermstedt hatte zur Verstärkung des Festorchesters seine eigenen Elitebläser aus Sondershausen mitgebracht. Spohr zog den größten Nutzen aus ihrer Anwesenheit und ihren Fähigkeiten und schuf zahlreiche Möglichkeiten des Zusammenspiels zwischen ihnen und ihrem leitenden Klarinettisten. Im Es-Dur-Konzert folgt Spohr mit seiner vollen Orchestereinleitung dem klassischen Vorbild. Aber nach einer aufrüttelnden Geste des Orchesters in den ersten paar Takten gestattet er dem Solisten raffiniert eine kurze Antwort, bevor das volle Orchester richtig in Gang kommen darf. Passend zum Anlass des Musikfests findet man hier reichlich feierliche Musik für Trompeten und Pauken. Das zweite Thema wird von einem Marschrhythmus beherrscht und erklingt zuerst in der unerwarteten Tonart Des-Dur, bevor es seine Zieltonart B-Dur erreicht. Wiederum gibt es in der „Durchführung“ ein neues Thema, das eine sich vom übrigen festlichen Prunk absetzende romantische, lyrische Stimmung liefert. Wie in allen vier Klarinettenkonzerten Spohrs und in den meisten seiner anderen Konzerte gibt es auch hier keinen Platz für eine Kadenz. Spohr war der Meinung, dass Kadenzen die schlimmsten Seiten in den Solisten hervorbringen, und lehnte sie deshalb im Allgemeinen ab. Für das Adagio wählte Spohr eine seiner Lieblingstonarten, As-Dur, für die er sich auch im C-Moll-Konzert entschieden hatte. Hier haben wir es allerdings mit einem ausgewachsenen Satz zu tun, in dem das satte tiefe Schalmeiregister der Klarinette wunderschön zur Geltung kommt. Der Satz enthält auch einen tief beeindruckenden kontrastierenden Abschnitt in c-Moll, wo der Solist dramatische Läufe und Sprünge ausführt. Zudem treten die Holzbläser des Orchesters, besonders die Flöte und das Fagott, in den Vordergrund und stehen kurz gemeinsam mit der Soloklarinette im Rampenlicht. Der Schlusssatz („Alla Polacca“ – im damals modischen polnischen Stil) beginnt mit der solistisch auftretenden Pauke, die von den Hörnern beantwortet wird, bevor die Soloklarinette das Hauptthema vorstellt. Dieser einleitende Austausch zwischen Pauke und Hörnern spielt auch im weiteren Verlauf des Satzes eine wichtige Rolle. Hermstedt war besonders für sein Spiel im hohen Register berühmt. Deshalb gab ihm Spohr die Möglichkeit, dieses Talent vorteilhaft zur Geltung zu bringen, indem er vom Solisten forderte, in die stratosphärischen Höhen eines viergestrichenen Cs hinaufzusteigen, eine harte Prüfung selbst für Interpreten heutzutage. Das Frankenhausener Musikfest war so ein großer Erfolg, dass ein zweites Fest für 1811 geplant wurde, wiederum unter Spohrs Leitung. Für dieses Musikfest sollte er eine Sinfonie schreiben (seine erste, in Es-Dur, op. 20). Dadurch musste sich Hermstedt, der sich natürlich wiederum ein neues Klarinettenstück erbeten hatte, mit einem zehnminütigen Stück zufrieden geben. Spohr komponierte das Potpourri in F-Dur im Frühjahr 1811. Es wurde am 11. Juli jenes Jahres in Frankenhausen uraufgeführt. Das Potpourri ist nicht bloß ein Medley. Vielmehr spann Spohr aus den zwei gewählten Themen virtuose Variationen. Spohr wählte seine zwei Themen aus der damals sehr beliebten Oper Das unterbrochene Opferfest des Mannheimer Komponisten Peter von Winter (1754–1825) aus und schuf de facto ein dreisätziges Concertino. Der Anfangsabschnitt, Larghetto, beruht auf Myrhas Arie „Ich war, wenn ich erwachte“ (Nr. 9 in der Oper). Die hervorstechenden Hörner zu Beginn wurden zusammen mit dem Thema aus der Oper übernommen. Darauf folgt ein Allegro über ein Vokalquartett (Nr. 8 in der Oper), „Kind, willst du ruhig schlafen“. Dann beschließt eine Allegretto-Version des gleichen Themas das Werk. Trotz des hohen Lobes, mit dem man Spohrs Kompositionen für Klarinette überschüttete, sicherten sie sich nicht gleich einen Platz im Repertoire, wohl aufgrund der langen Verzögerung bei der Veröffentlichung der Klarinettenkonzerte (außer dem ersten) sowie der in den Werken geforderten ungeheueren spieltechnischen Schwierigkeiten. Das zweite Konzert erschien erst 1822 als op. 57 im Druck, das Potpourri 1830 als op. 80 und die Variationen erst 1890 lange nach Spohrs Tod. In einer kurzen Zeitspanne von gerade einmal etwas über zwei Jahren hatte Spohr für Hermstedt also die vier hier eingespielten Werke komponiert. Weitere sollten sich über die nächsten 26 Jahre hinzugesellen: zwei weitere Konzerte (f-Moll, WoO19, 1821; und e-Moll, WoO20, 1828), eine Fantasie und Variationen über ein Thema von Danzi, ein Notturno für Hermstedts eigenes Harmoniekorps, wobei die Klarinette als Soloinstrument auftritt, eine Liedersammlung und eine Arie, in denen jeweils auch eine Klarinette gefordert wird. Diese zehn durch Hermstedt ins Leben gerufenen Werke für bzw. mit Klarinette behaupten sich stolz unter den einfallsreichsten und schönsten Kompositionen Spohrs.